One of the design considerations of the Common Core State Standards is the integration of research and media skills into the literacy framework. To be ready for college, workforce training, and life in a technological society, students need the ability to gather, comprehend, evaluate, synthesize, and report on information and ideas, to conduct original research in order to answer questions or solve problems, and to analyze and create a high volume and extensive range of print and nonprint texts in media forms old and new. The need to conduct research and to produce and consume media is embedded into every aspect of today’s curriculum. In like fashion, research and media skills and understandings are embedded throughout the Standards rather than treated in a separate section. When students conduct research, they act as detectives, putting together the pieces of a story or puzzle. In the TPS-Barat Level III training, we discuss how students act as primary source investigators (PSI) when working with primary sources in authentic contexts. One of our participants, library media specialist Kathy Ruck, knew the concept of PSI would resonate with her elementary students. To make the learning even more fun, Kathy enlisted the help of her artist/graphic designer husband, Joe Ruck, to make PSI badges for the students. Some of the students wore them while analyzing primary sources to get them into the right frame of mind while others earned them upon completion of their research and primary source analyses. 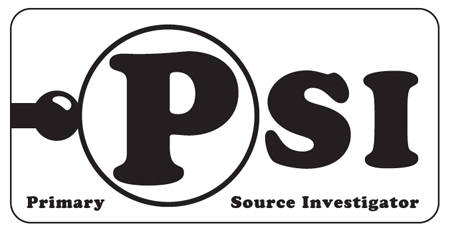 Kathy and Joe have graciously agreed to provide .pdf files of the PSI badges for use with your students. If you have a unique way of teaching with primary sources, please let us know in the comments section or send us an email.